Radio Ballad No 2 - Ewan MacColl, Charles Parker, Peggy Seeger, etc. 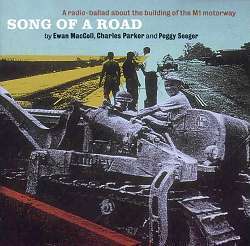 Song of a Road was the second of the MacColl-Parker-Seeger Radio Ballads and is, perhaps, the least well known. This is, no doubt, in part due to the fact that it was never released on LP format by Argo in the 1960s, unlike most of the other Radio Ballads. I wonder how influential those LPs were, compared with the original radio broadcasts? I remember seeing a copy of the LP The Ballad of John Axon at grammar school in the late 1960s, although I have no recollection of it ever being played in the classroom. Each of the Radio Ballads, in different contexts, would have provided excellent teaching materials. Would they do so today I wonder? Song of a Road is about the building of the first stretch of the first motorway in Britain. At the time, it was called the London-Yorkshire motorway, but we know it by the title that was later adopted - the M1. Motorways are something we now take for granted, but of course they are comparatively recent. The Radio Ballad was first broadcast on 5 November 1959, three days after that first stretch of motorway from Watford to Rugby, was opened: exactly 40 years ago at the time of writing this review. Ewan MacColl's introduction to the Song of the Road printed in the CD booklet compares the construction of the motorway to the building of the Roman road which took a similar route, and describes the workforce as "descendants of men who had built Britain's canal and railway system." And so it must have seemed at the time. The tremendous challenge of building the motorway, and the symbol of modernity that it proclaimed, now seem a long way from the current preoccupation of demonising the motorcar and the environmental impact of road building. Swampy and his colleagues could not have been a consideration in 1959, and we are now less inclined to see the motorway worker as 'hero' as the traffic cones disrupt and delay our journeys. The Ballad of John Axon (the first Radio Ballad) dealt with a specific story and was based on interviews with a small number of people. Song of a Road was altogether different - the potential scope for gathering 'actuality' was 19,000 workers spread over 60 miles. The construction involved not just the physical labour, but also the planning and design. The management not only wanted their point of view to be included, but they were also anxious that a positive impression should be given by the interviewees. To this purpose, MacColl, Parker and Seeger were followed round by a Public Relations Officer - the 1950s equivalent of a spin doctor - whose presence convinced the workforce that the BBC were working for the management ... so they clammed up. Fortunately the PRO was withdrawn and the interviewers were allowed a free hand, which led them from the building sites to the pubs to the hostels and dormitories (many of the workers were Irish, living away from home) and back to the building sites. With almost 90 hours of tape, the 'construction' of the Radio Ballad could begin. The first 12 minutes of the CD concentrates on the planning and design of the motorway with some anonymous actuality from the planners, and details of the size, amount of soil to be moved, how much it will cost, and so on - much of it sung by MacColl. But there's not much actuality from the construction labourers themselves until we get to track 6 which is a series of sound-clips identifying their homes. "My name is Jack Hamilton - yes, Cork City ... Co Mayo … Whitehaven … Norfolk Diss … Poland … Hungary … no fixed abode … Peterhead … Mayo … Carlow … Newcastle-upon-Tyne … Belfast … India … just down the road." It definitely makes an impact. The music is woven into the actuality in the style so characteristic of the Radio Ballads, but it's not until track 9 that the music appears to start dealing with the essential task of building the motorway. Come all you Gallant Drivers is sung, I guess, by Francis McPeake, and then on track 10, Bert Lloyd's voice is heard on I'm a Roving Rambler. Other singers include Louis Killen and Cyril Tawney. The most notable song of the Radio Ballad is Hot Asphalt (You can talk about your concrete …) sung by Seamus Ennis on track 19. The memorable line in the chorus is "If it [the asphalt] doesn't last for ever, then I swear I'll eat my hat" - given the amount of resurfacing up and down the country since 1959, no wonder we don't see many hats any more. "…we fumbled the opportunity. We found ourselves asking questions about road-building, about running a concrete-batching plant, about prefabrication techniques. Worse, we found ourselves incorporating the answers in the programme itself. In short, we were behaving as though our intention was to create a programme which would inform the listeners how to build their own motorway … The consensus of opinion among those who worked on Song of a Road was that the programme was an uneasy compromise between a typical feature programme and a radio-ballad and a not particularly good example of either." So how do we assess Song of a Road? As a Radio Ballad or as a radio feature? Compared with the earlier Ballad of John Axon or the later Singing the Fishing, Song of a Road is a disappointment, although The Observer radio critic called it a "near triumph by John Axon standards and an absolute marvel by any other." As a radio feature, I have no recordings of other radio features of the time to compare it with - although with its high musical content, it must have been very different to the usual fare. Listening to the CD, it gave me very little feel about what it was like to build a motorway - trying to picture it in my mind, I had the benefit of seeing construction and maintenance workers on today's motorways. And I know what a motorway looks like. In 1959, the general radio listeners had no real concept of the size and scale of motorways, so they would have needed a vivid imagination. Today, it seems rather quaint, rather dated, but an essential part of understanding the process of constructing the whole series of Radio Ballads.